The name is quite an unusual one, literally meaning ‘the bachelor of Melaka’, especially as Melaka (Malacca) is a long distance away. It has been proposed that ‘bujang’ is actually from ‘bujangga’ meaning serpent or dragon, as mountains in ancient times were associated with dangerous beasts and in some places in eastern Indonesia still are. The origins of the name of Melaka city comes from the Melaka tree (Phyllanthus emblica, ‘pokok Melaka’ or Indian gooseberry) so it is possible that the area was known in the past for a place where these trees were grown. From the village of Batu Berangkai (70m) just 1 kilometre from Kampar train station, it takes most hikers around 4 hours to ascend and 3.5 to descend, not including breaks. Many choose to camp one night at one of several suitable places on the trail, and some hike the neighbouring lower peak called Gunung Relau (951m). The trailhead proper is the waterfall car park (150m, CP1) which is popular with locals at weekends so it is recommended you arrive early. The waterfall is just on the right, near a small Chinese Buddhist shrine with incense at the base of a large tree. Follow the track into plantations, keeping the river on your right for the most part, and near to a few water pipes leading up the gentle slopes. There are a few minor trails in this area so it is easy to get lost, but if you follow the river and water pipes you should arrive at Pondok Orang Asli (275m, CP2) in just 20 minutes or so. This is a simple dwelling lived in by a small number of members of Malaysia’s indigenous people, presumably the Senoi tribe. Just before Pondok Orang Asli, look out for a Button Mangosteen tree (garcinia prainiana), a pleasant fruit known to locals as ‘cherapu’ or ‘ceropu’. Beyond Pondok Orang Asli, the trail continues to gradually lead up the hillside in the river valley leading towards the col between the two main peaks of the Bujang Melaka range, namely Bujang Melaka itself (on the left / north) and Gunung Relau (on the right / south). 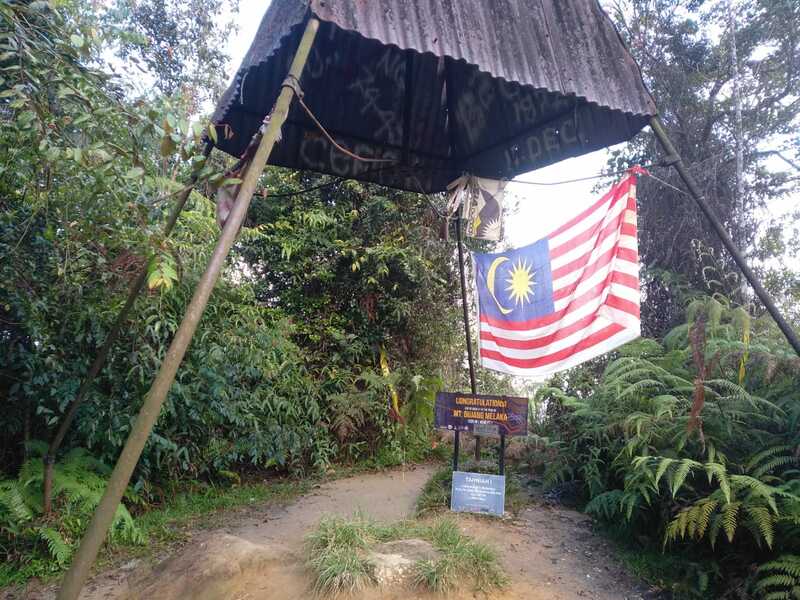 Some hikers have actually accidentally climbed Relau instead of Bujang Melaka because although the trail to Bujang Melaka is well-marked, the junction for Relau (300m, near the river, small camp area just beyond) is not properly marked at all! If you follow the most well-used path you should have no problems, and after this point there is only one trail (other than very short sections of alternative path which always rejoin the main trail shortly after). Listen out for siamangs in this area as there are many in the forests here. The next landmark is Balak Camp (475m, CP3) which fit hikers will have reached in an hour or just over. This is a decent sized area with enough space for 4 or 5 tents. Less than a kilometre beyond is a ‘water point’ (685m) with a sign), although on this trail you are never truly far from a stream until above 1,000m. The steepest section of trail follows, with several roped sections over tricky roots and steep rock, although nothing especially technical. There are several small streams to cross and a large fallen tree trunk to clamber over with the help of a thin rope. If you look south you will be able to see the lower Gunung Relau (951m) a couple of kilometres away. There is also a very beautiful overhanging rock (770m) which would provide a little shelter in times of rain. Fit hikers should have arrived here in just over 2 hours total from the waterfall car park. Lebah Camp (1,014m, CP4) is the largest and most popular camping area and is a delightful temperature. The last water source is down to the right, just two minutes away from the camping area. Most hikers should be here within 3 or 3.5 hours (not including breaks). 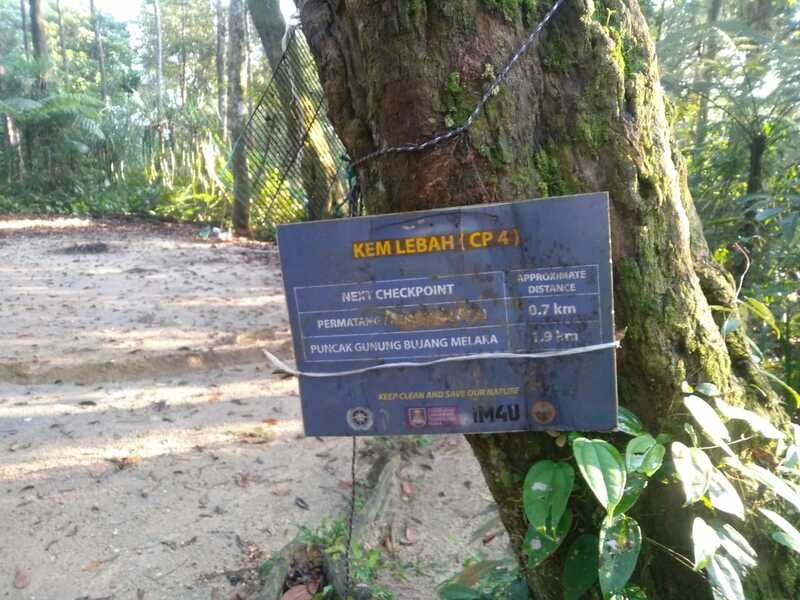 Checkpoint 5 soon follows (1,185m, Permatang or Persi Camp) and is not really very suitable for camping due to its small size and uneven, rooty ground. The trail beyond Persi Camp leads down a little way before ascending again to the true peak of Gunung Bujang Mekala. About 50 metres before the peak is another lovely boulder worthy of a few photographs. The summit of Bujang Melaka is a small clearing with summit signs, the usual ‘beirut’ (surveyors’ large metal tripod) found on mountain summits across Peninsular Malaysia and a limited view from a cluster of small rocks. These rocks appear to be the highest ground and in good weather the view is reasonable, but do take extra care here because there is a large hole between the rocks and falling down there would cause serious injury. The summit signs suggest the peak is 1,233m high, but other sources suggest 1,234m and 1,240m respectively. Our GPS gave a reading in excess of 1,240m so the latter could definitely be possible. Fit hikers will have reached the top in 4 hours or less, whereas those feasting on noodles and cigarettes every 20 minutes will need considerably longer. 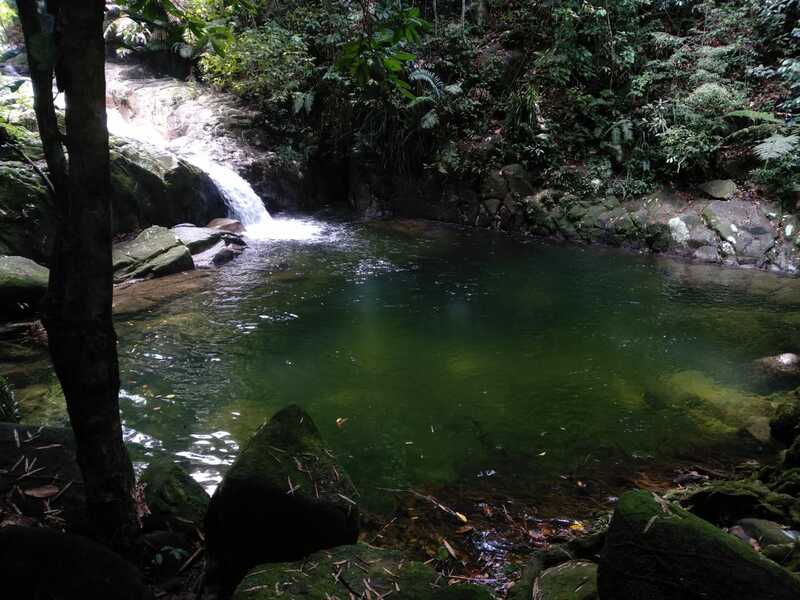 Gunung Relau is well worth an explore too, but as the junction with the main Bujang Melaka trail is at an elevation of only around 300m, it means you have a an extra ascent of 650m if you are fit and keen enough to try to fit it into the same hike as Bujang Melaka peak. 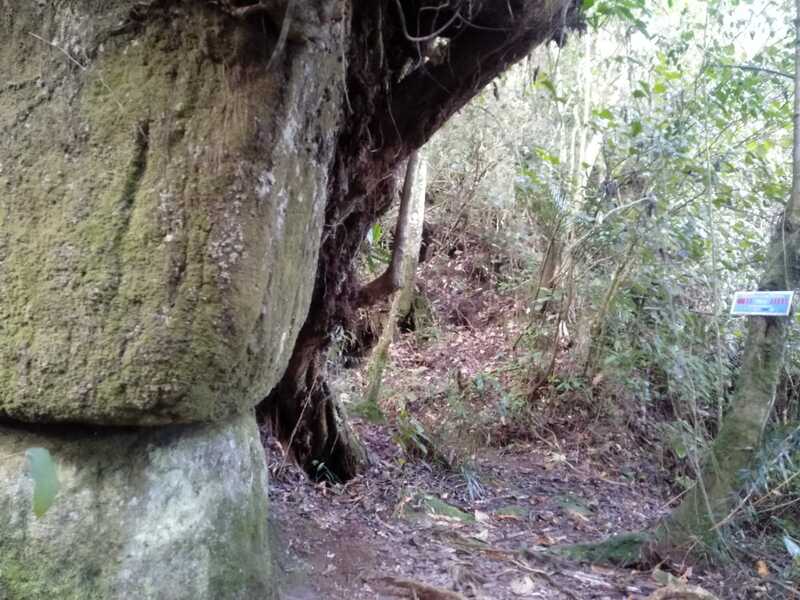 Although there is no view at the top of Gunung Relau and the trail there is steep, there is a large amount of old ammunition boxes from British colonial times. Quite when or what this stuff was left there for originally is unclear! Back down near the Pondok Orang Asli, about 200 metres before (on descent), is a small wall which may have been constructed in colonial times and may potentially be linked to the ammunition boxes at the top of Gunung Relau. Presumably the British military came this way to Relau. If anyone can shed any light on the history of this site please do get in touch below. Honey lovers might like to know that an unusual local honey made from stingless kelulut (bee) is available locally. Ask in the village for Pak Nordin. Getting there: Kampar is the closest train station (only 2km from the trailhead) and is 2 or 2.5 hours from KL Sentral. For those trying to arrive/leave as late as possible, in 2019, there is a northbound train leaving KL around 2330 and one returning south arriving KL again around 2120. Accommodation: Several hotels in Kampar – MD Boutique recommended. Larger selection in Ipoh. 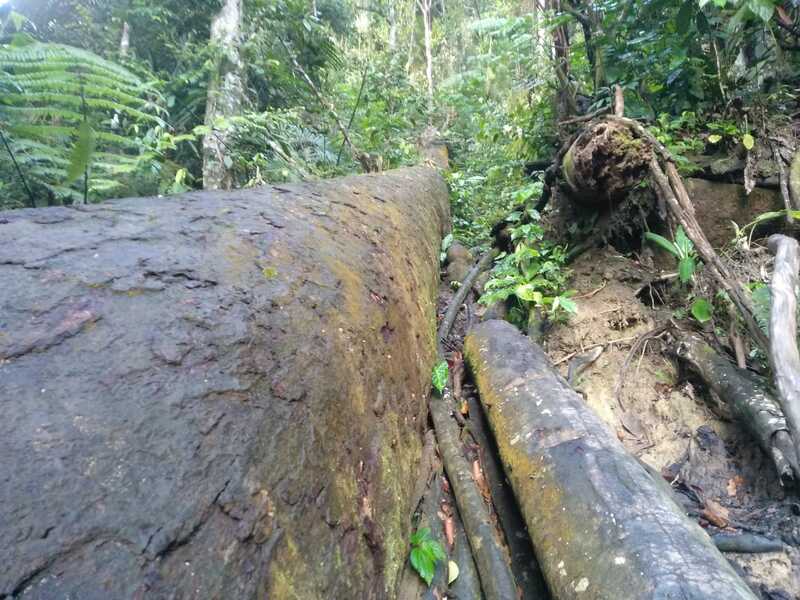 Permits: Technically required from Pejabat Hutan Daerah Kinta Manjung (office in Batu Gajah) but obtaining it is incredibly inconvenient unless you are in a large group with a professional guide or have the time and means to visit their office on a weekday. In reality, many hike without a permit and it is hoped the authorities will change the system to make following the rules easier (e.g a ticket at the trailhead run by a local villager rather than a 2 hour road trip to a government office!) The trail may be officially closed from November to January. Water sources: Available often and as far up as Lebah Camp (1,014m) which is CP4. Therefore one large water bottle per person ought to be enough for day hikes. Very happy to have managed to hike this nice little mountain. It was looking somewhat unlikely after repeated attempts to find local guides or even just a local hiker or two that wanted to join me ended in failure or ludicrously inflated prices (a common theme when hiking in West Malaysia, especially as a foreigner). 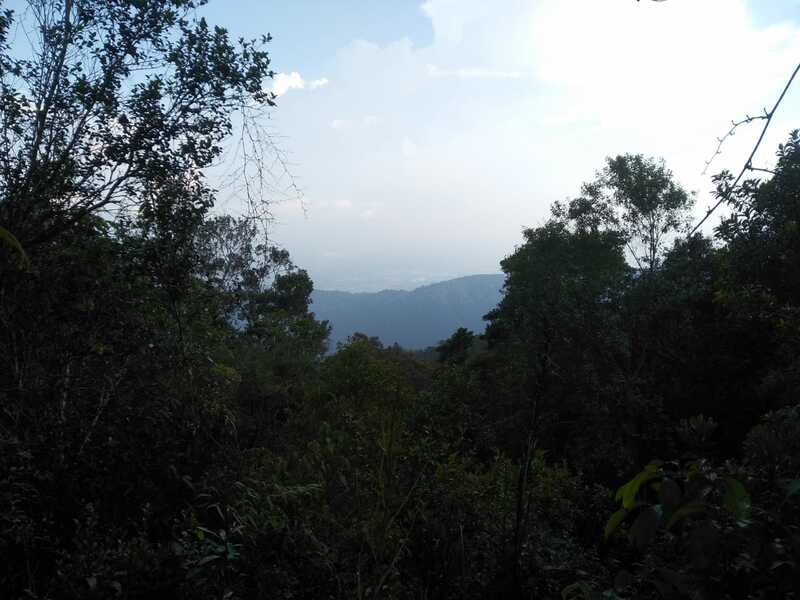 It eventually turned out really well indeed, but it’s worth writing a bit about all the problems I had too, to hopefully enlighten those hoping to hike this and other Malaysian mountains and help those trying to gouge hikers for every last penny reconsider. The next one was Salan from Silver Outdoors Sports in Ipoh. He asked for rm200 plus rm20 permit. I was agreeable to this and happy to have found someone fair-minded. Then a week later he said it would be an extra rm100 for ‘management fees’! He added ‘normally for foreigner my company charge rm300 for mount bujang melaka. u come alone so i reduce the price because i pitty at u’. This kind of open racism is a disgrace so I told him where to go. Next I found Mohammed Mansur. He said rm450 total! So I told him where to go too! After that, I found Miss Fatin who runs activities for Sahom Valley resort. She put me in touch with a guide named Syahid who asked for rm800 (the normal price for ten hikers). When I questioned this price for just one hiker he just said ‘yes, that’s the price’ and clearly couldn’t be bothered wasting his time on anything less. Assuming a guide made rm800 per day and worked just ten days per month, he or she would be on rm8000, a huge salary by Malaysian standards. There is definitely a huge gap in the market for affordable mountain guides in Malaysia specializing in small groups rather than these ludicrous 10 or 20-strong, noisy clubs who hike painfully slowly. I was about to give up when I spoke to Mykhailo who had recently climbed Bujang Melaka – alone, as per usual! He told me about the kelulut honey made on its slopes so I got in touch with locals via that link and it seemed somebody would be willing to help in the village. I emailed the Forestry department to ask about permits and got no response whatsoever. 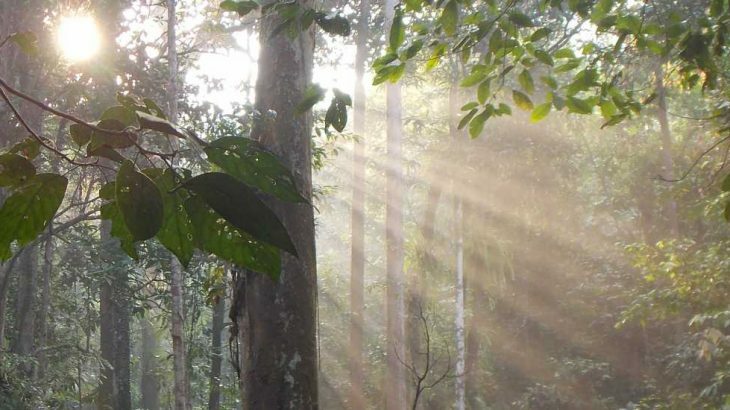 To expect hikers to spend several hours to visit an office in an obscure location in Batu Gajah just in order to walk in the forest legally is a pretty tall order. This service should be available online by now, especially given that some hikers are on really tight schedules (especially those coming from Jakarta and other distant places!) Do they deliberately make it difficult to keep numbers low, or are they just not that interested in tourism? There is actually a small forestry office in Kampar itself, but unlikely to be open on weekends and may not have sufficient authority to make a permit for hiking. Anyway, at the very least it would be sensible to register your hike with at the Kampar police station, just incase you have a problem. Kratom (ketum) seems to be quite common in the Kampar area, with folk allegedly driving over the border from Thailand to collect it. It has been technically illegal to use in both Thailand and Malaysia for a couple of years now. People take it for energy and alertness, but it can also create euphoric feelings and a sense of calm but is probably pretty dangerous for anyone driving. I flew to KL and took the train from KL Sentral at 1505, arriving in Kampar at 1720. Kampar is a very sleepy town and the main street Jalan Idris is just 5 minutes’ walk away down an overgrown pavement from the train station. The mountain range is very close by, the valley between Bujang Melaka and Relau peaks clearly visible from the station and town centre. MD Boutique Hotel has just recently opened and was absolutely perfect and good value for the price. Next door to a 24hr 7-11 too. Quite a strong Chinese influence with numerous beer signs on the main street. I messaged the local guide to arrange everything for the hike and had an early night. The next morning up near the trailhead I was quite surprised to meet a friendly American woman, Liza, living in Batu Berangkai village. It’s always nice to meet other ‘non-locals’ on these trips. 4 of us did the hike, including one guy training for Kinabalu and one friendly Orang Asli boy who was the strongest of the lot. A couple of them were collecting rattan. I made it to the summit in 3h40min and back down in just over 3 hours. I would say 8 hours round trip is about right (to include break time). Back at the waterfall, a driver wound down his window and asked me where I was from. It turns out he had just returned home to Malaysia after working in Australia for a few years so was obviously keen to speak to foreigners. Reverse culture shock is a fascinating experience and something I have had myself. ‘Have a good one, mate!’ he yelled as he drove off! There was another group on the trail as we were coming down – they had already been up Relau and were doing both peaks in a single day – perhaps 11-12 hours! We were back in the village by around 4pm, and a big storm arrived not long after. It must have been quite unpleasant for the other group still high up the mountainside as they were pounded by strong winds and torrential rain and even lightning strikes. We were more than fine as Liza made us a very nice meal. Amazingly I had to get back to Jakarta the same day as I had work the next morning. So I was booked on the train at 1855 back to KL Sentral. The ticket checker at Kampar station started talking to me about Indonesia, as his wife was from Central Java. He kept on going on about Nyai Roro Kidul controlling the island as he walked up and down the platform. Other passengers seemed rather bemused at his mystical comments in broken English! The journey itself on the train is very much a journey of two halves – the section north of Rawang is great – full speed, good progress. But the stretch between Rawang and KL is much, much slower and for what is a fairly short distance as the crow flies. Made it to KLIA2 in good time for a couple of vegetarian pies and the last AirAsia flight at 2350. My 82nd Ribu (in Indonesia, Malaysia, East Timor) successfully bagged.